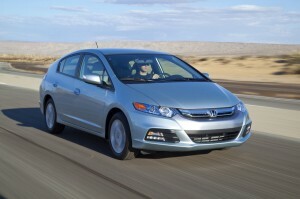 Drivers searching for a great hybrid vehicle should visit our Chester area Honda dealership for the 2013 Insight. The Insight has carved out a niche among the Honda lineup, delivering an incredibly affordable hybrid experience to drivers across Orange County, and with the 2013 model, you’ll be seeing more Insights on the road than ever before. There are many other environmentally friendly vehicles out there too, like Chevrolet’s Volt, but we think that you’ll find the Insight to be the superior vehicle when matched up side by side with the facts. Honda also brings their famed safety record to the table with the Insight, offering electronic brake distribution, front and active head restraints, and more, all as standard features. You can also help protect your investment with the included anti-theft stereo. None of these features are available on the Volt. Finally, you’ll find plenty more room in your Insight, thanks to its increased first and second row headroom, increased legroom, and even seating for one additional passenger over the Volt’s 4-person seating. Your cargo space is increased dramatically with the Insight, too — you’ll get 15.9 cubic feet of storage with the Insight to the 10.6 cubic feet of the Volt. While there are plenty of great new Honda vehicles at our Middletown dealership, we’re particularly excited to see drivers get behind the wheel of the 2013 Insight. If you’ve got any questions, don’t hesitate to contact us — we’re here to help!